Buy MT8870 DTMF RECEIVER Online at LOW COST in India on dnatechindia.com. Delivery all over India. The MT8870D/MT8870D-1 is a complete DTMF receiver integrating both the band split filter and digital decoder functions. The filter section uses switched capacitor techniques for high and low group filters; the decoder uses digital counting techniques to detect and decode all 16 DTMF tone pairs into a 4-bit code. External component count is minimized by on chip provision of a differential input amplifier, clock oscillator and latched three-state bus interface. 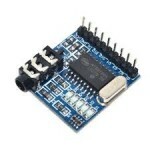 MT8870 DTMF Decoder ModuleThe MT8870 module is a low power device DTMF decoder chip. It is a complet..